Braddy, S. J., R. J. Aldridge, S. E. Gabbott, and J. N. Theron. 1999. Lamellate book-gills in a late Ordovician eurypterid from the Soom Shale, South Africa: support for a eurypterid-scorpion clade. Lethaia 32:72-74. Coddington, J. A. and R. K. Colwell. 2001. Arachnids. Pages 199-218 in Encyclopedia of Biodiversity. Volume 1. S. A. Levin, ed. Academic Press, San Diego, California. Dunlop, J. A. and M. Webster. 1999. Fossil evidence, terrestrialization and arachnid phylogeny. Journal of Arachnology 27:86-93. Giribet, G., G. D. Edgecombe, W. C. Wheeler, C. Babbitt. 2002. Phylogeny and systematic position of Opiliones: a combined analysis of chelicerate relationships using morphological and molecular data. Cladistics 18:5-70. Harvey, M. S. 2002. The neglected cousins: What do we know about the smaller Arachnid orders? Journal of Arachnology 30(2):357-372. Harvey, M. S. 2007. The smaller arachnid orders: diversity, descriptions and distributions from Linnaeus to the present (1758 to 2007). Pages 363-380 in: Zhang, Z.-Q. & Shear, W.A., eds. Linnaeus Tercentenary: Progress in Invertebrate Taxonomy. Zootaxa 1668:1–766. Shultz, J. W. 1989. Morphology of locomotor appendages in Arachnida - evolutionary trends and phylogenetic implications. Zoological Journal of the Linnean Society 97:1-56. Shultz, J. W. 1990. Evolutionary morphology and phylogeny of Arachnida. Cladistics 6:1-38. Shultz, J. W. 1994. The limits of stratigraphic evidence in assessing phylogenetic hypotheses of recent arachnids. Journal of Arachnology 22:169-172. Shultz, J. W. 2007. A phylogenetic analysis of the arachnid orders based on morphological characters. Zoological Journal of the Linnean Society 150(2):221–265. Starobogatov, Y. I. 1990. System and phylogeny of Arachnida (analysis of morphology of paleozoic groups) [Russian]. Paleontologicheskii Zhurnal 24:4-17. Weygoldt, P. 1998. Evolution and systematics of the Chelicerata. Experimental & Applied Acarology 22:63-79. Weygoldt, P. and H. F. Paulus. 1979. Untersuchungen zur Morphologie, Taxonomie und Phylogenie der Chelicerata. 1. Morphologische Untersuchungen.. Zeitschrift für Zoologische Systematik und Evolutionsforschung 17:85-116. Weygoldt, P. and H. F. Paulus. 1979. Untersuchungen zur Morphologie, Taxonomie und Phylogenie der Chelicerata. 2. Cladogramme und die Entfaltung der Chelicerata. Zeitschrift für Zoologische Systematik und Evolutionsforschung 17:177-200. Wheeler, W. C. and C. Y. Hayashi. 1998. The phylogeny of the extant chelicerate orders. Cladistics 14:173-192. Introduction to the Cheliceramorpha. UCMP Berkeley. 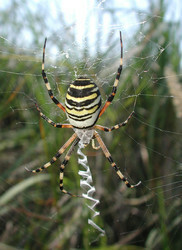 Arachnodata. The Arachnological Information and Coordination Agency. Arachnida Catalog. Department of Entomology, Texas A&M University. Arachnid Origins and Evolution. Jason Dunlop's home page. Museum für Naturkunde Berlin. Spiders on the Web. Peter Bryant's photos of spiders and other arachnids. The World of Spiders and Scorpions. Images from Thais in 2000. Page: Tree of Life Arachnida. Spiders, mites, scorpions, whipscorpions, pseudoscorpions. The TEXT of this page is licensed under the Creative Commons Attribution-NonCommercial License - Version 3.0. Note that images and other media featured on this page are each governed by their own license, and they may or may not be available for reuse. Click on an image or a media link to access the media data window, which provides the relevant licensing information. For the general terms and conditions of ToL material reuse and redistribution, please see the Tree of Life Copyright Policies.